The day after I completed my camp hosting duties as I was eating I felt something weird and it turned out to be my front tooth. I had my front tooth knocked out when I was 18 and 50+ years later the crown decided it had enough eating and came out. A couple days later I had to attend a going away party for all the camp hosts. What a bummer. Since I am moving into Oregon I was able to get cheaper insurance then my costly AARP prescription drug plan and my medicare supplement by replacing them with a Kaiser Permanente plan. For $41 they have a dental plan that covers minor dental and cleanings. However they were only able to offer me a flipper device which attaches via suction to your gum and gives you a temporary fix. However you can’t eat with this device. So I called Dr Eva Urena’s office in Algadones, MX to check on the possibility of getting an implant. Sure enough they can do it and the cost would be about 1/4 the cost here in the US. I decided to fly down to Yuma, get a motel for a few days with a rental car to get around in. I booked everything on line, called the PetHotel (Petsmart) and made a reservation to board Chica. Since Chica stayed at the PetHotel in Aliso Viejo, CA they were able to get all her records. Left last Saturday at 11:00 am to take Chica to Tualatin, OR in plenty of time for my drive up to the Portland Airport at 4:55 pm. Her is a pic of Chica seeing me off. She was not very happy. I always feel so bad whenever I leave her anywhere, even at the groomer. I got to the airport in plenty of time even with the heavy traffic due to an accident. It took about 2 hours to get to San Francisco where I had a 3 hour 52 minute layover. I walked around the airport for a while and noticed the first game of the World Series was on. I found a nice place where I could pick up a sandwich and beer to watch the end of the game. Wouldn’t you know it but the game went into extra innings and I had finished my sandwich and beer. I figured I ought to get another beer so I could continue watching the game. I sipped that but it was gone and the game still going on. I left the bar and found a seat in the waiting are where I could still see the game. It was a great game but too long with KC finally winning. At 10:40 pm the 2nd plane took off for San Diego and landed there at 12:16 am (now into Wednesday). This was going to be the worst part of my journey. I have a 6 hour and 14 minute layover. I was upstairs in the boarding area getting my phone and computer charged up. The chairs are also much more comfortable up there. Then a policeman comes up and tells me I can’t wait up there as they are cleaning the area so I have to go downstairs. NO COMFORTABLE SEATING DOWNSTAIRS. Plus I have to wait over 6 hours until my next flight. Nothing is open and there is no place to plug in. They don’t even have a vending machine. That was probably the longest 6 hours I have spent. Finally at about 5:30 am I made my way back through the TSA area for the second time on my journey. YUK ! The plane took off at 6:30 am and landed in Phoenix at 7:53 am. Then I had to hike to the complete opposite end of the airport to get my next flight. My layover was only 52 minutes and I was able to get a strong cup of coffee to keep me going. Finally I was off to my destination in Yuma at 8:45 am landing at 9:51 am. From there I walked to the Hertz booth where I had reserved a car on-line. I am glad I did reserve it as everyone behind me weren’t able to get a car until late in the afternoon. Picked up the car and off I went. I was going to check-in clean up and brush my teeth before going to the dentist, but realized I couldn’t check into the motel until 3:00pm. What a bummer!!!!! I decided after traveling all night I had better brush my teeth before going to the dentist. I found a McDonalds and grabbed my tooth brush and tooth paste and used their bathroom. I also bought breakfast there as I was starving. I made my dental appointment for 12:00 pm so after eating and brushing my teeth I headed to Algadones. Dr Eva needed a CT Scan of my mouth in order to decide how to proceed with my implant. Her office ordered someone to pick me up, take me to have my CT Scan and drive me back to their office. All this only took about 1/2 hour. Then she and a Periodontist conferred on my implant. It seems that there was still a portion of my root still left in my gum. They decided to cut into my gum remove the remaining root and then replace it with bone and the implant at the same time. YUK!!! They wouldn’t be able to do this until tomorrow. Early Thursday I was the first appointment. A specialist worked with her to complete the process and I was out of there and heading back to my room to heal. They gave me pain medication and antibiotics. The implant went well, but they wanted me to return Friday morning for a follow-up. That is one of the main advantages of the dentist in Algadones. They will do anything to accomodate you. Dr. Eva knew that I had flown down to Yuma expressly for the dental work and would be flying back on Saturday. Anyway I got everything done and now just have to wait 4 months to get my permanent tooth while my mouth heals. I only have three flights to contend with on Saturday and will be home at 5:29 pm. Then to Tualatin to pick up my baby. I can’t wait. Then in 4 months turn around and do it all again. Hopefully fewer then seven flights. This entry was posted in Algadones, Chica, Dentist, Mexico and tagged Algadones, Chica, Dentist by Jim Melvin. Bookmark the permalink. OY! Airline travel these days seems so intimidating. Boy oh Boy….that was some journey. I can’t believe that you need that many flights just to get to Yuma. Aren’t you getting down there again with your MH? 4 months from now is still winter time. I am not sure whether I will go down there this winter. My new home should be ready to move into sometime in Jan so want to be in Oregon to get everything organized. Ouch! Long flying time and sounds like painful dental procedure. Good thing you had rental car and hotel reserved. Amazing that even with the cost of flights, hotel, rental car and boarding Chica that it is still cheaper to have the dental work done in Los Algodones. Heal fast. I bet Chica will be besides herself with joy when you pick her up. But what a nightmare of planes just to get to Yuma. I don’t fly anymore unless it’s a total and complete emergency. But you can’t beat the dental work and price in Mexico. My gosh, Jim! You are a patient soul–that is one long layover! Would it be easier to fly into San Diego & just drive down? However you get there, glad you are happy with the work they’ve done. We’re getting our teeth cleaned in Algadones this winter–we’ll definitely go see Dr. Eva & her staff. 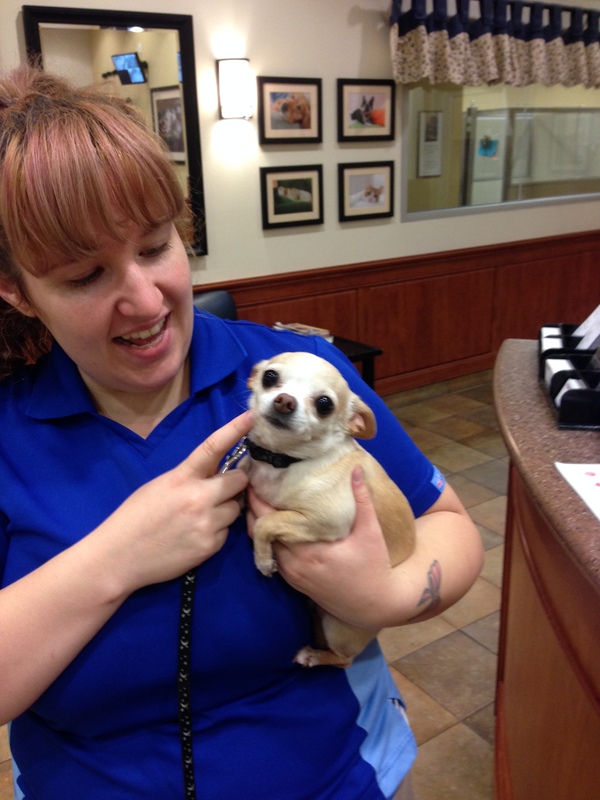 Take good care–ear skritches to Chica! You won’t be disappointed by Dr Eva and her staff. She is great. Glad you’re able to take care of business Jim! Man, you could have just about driven to Yuma in the time it took to fly there! Glad all went well. Sounds like Dr. Eva and team took good care of you. When I made the appt she knew I was flying in from Oregon. I told her how long it took and she commented that I could have flown to Europe. Actually I flew to Japan in less time then it took me to fly to Yuma. Jimbo what is a tooth implant worth in Mexico? About $800 for the implant, then wait about 4 months and return for the tooth which runs about $700. This is opposed to $5,000 – $6,000 here in the states. Yes I know. Tom had one. Nice to know about Mexico. Hope all is well with you. We have the grand daughter and our son and wife at Walt Disney World here in Florida at the moment. I keep coming back to look at that sweet picture of Chica. She looks sooo sad, and knowing that you will be back in a few days makes it a sweet picture. Dr. Eva is who I plan to use for my implant when I get the money together. She is a great dentist and is very considerate of your needs. Say hi to here from me when you go. Thank you Jim for this informative post. I am new to your blog and so enjoyed this. I have needed 2 implants and have put it off because of cost. I too have the flipper. After a while I stopped using it. Also, thank you for the cost break-down, I wondered what it was costing.